New York City’s mayor may have behaved like plenty of other politicians, but progressives have an obligation to do better. 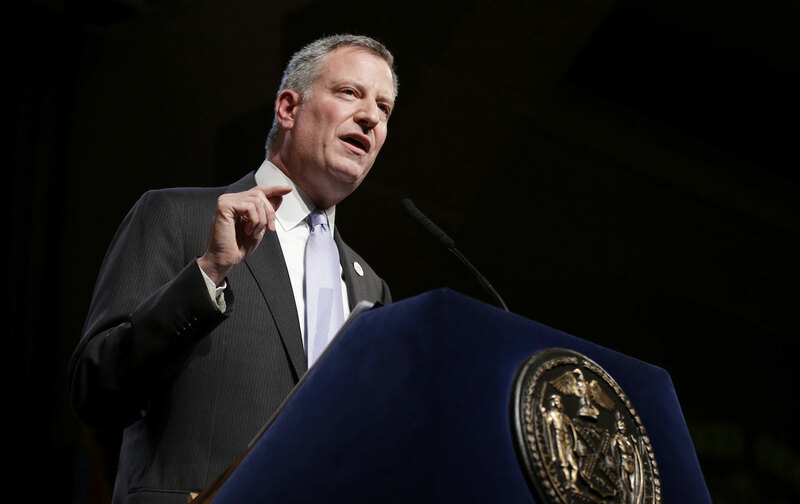 Sometimes it really seems like Bill de Blasio can’t catch a break. He defies the tabloid doomsayers, slashes the number of arrests the cops make, sees crime fall to new records, yet still has to deal with charges that his ideology has endangered the city. He settles dozens of overdue labor contracts and launches a massive universal pre-kindergarten program but is slurred as a lazy manager. He creates a municipal ID program with just shy of a million signups and secures a two-year rent freeze for 2 million tenants, but gets dissed for his gym habits. He learns—just yesterday—that neither state nor federal prosecutors are going to charge him or his aides for campaign finance violations, but receives an exoneration so qualified it basically writes the television ads his opponents will air against him later this election year. Why doesn’t New York City’s mayor get a break? Because his opponents to the right are too threatened by what he represents to miss a chance to belittle him. And because his erstwhile allies on the left believe that they have a right to expect more. De Blasio was never accused of doing anything for personal profit. Unlike Sheldon Silver, whose outside legal earnings were tied to favors he executed as speaker of the New York State Assembly, or Dean Skelos, who used his State Senate presidency to snag a juicy job for his son, or most of the many other New York pols who have done a perp walk in the past decade, no one ever said de Blasio had pocketed anything. Instead, the Manhattan District Attorney investigated whether he or his aides had broken campaign-finance laws in an effort to win back the State Senate for the Democrats, and the US Attorney looked into whether de Blasio or his people had illegally done favors for donors who had given to a nonprofit he’d set up to push his progressive agenda. Manhattan DA Cyrus Vance, meanwhile, informed the state Board of Elections via a letter that “this office has determined that the parties involved cannot be appropriately prosecuted, given their reliance on the advice of counsel”—a reference to the fact that de Blasio and his aides had received legal advice that a scheme to evade contribution limits, by asking donors give to county committees that then shared the money with candidates, rather than giving directly to candidates, was kosher. Since the de Blasio operatives thought they weren’t breaking the law, the logic goes, they can’t have broken the law. The prosecutors’ statements were far from an exoneration of the mayor. Much like James Comey’s summertime press conference about the Hillary Clinton e-mail investigation, during which the FBI director’s harsh language about the Democratic nominee made bigger headlines than his decision not to charge her, the Kim and Vance statements could be used as evidence against de Blasio in the court of public opinion. That’s a little troubling: Prosecutors aren’t supposed to be the arbiters of right and wrong. They’re supposed to charge and try people for breaking the law. It’s dangerous to invest those offices with some deeper wisdom or authority to pass judgement on the people we duly elect to lead us. De Blasio will, however, very likely be elected again. The smart money was already on him, and Thursday’s news tilts the odds even more in his favor. As Bradley Tusk, the former Bloomberg adviser who has been recruiting Democrats to run against de Blasio, said Thursday, “Although the city deserves far better than this, the people best positioned to succeed in a Democratic primary are now unlikely to run, and we should therefore expect four more years of Bill de Blasio.” Paul Massey, the Republican real-estate magnate who is gearing up to challenge de Blasio in November, warned on Thursday that he’ll be reminding voters about the corruption investigation as the election approaches. Massey has money and time to make inroads, but faces a huge registration disadvantage in a city where—with Donald Trump taking a jagged axe to the ideals and programs New Yorkers hold dear—the Republican brand is a concrete block sinking in the East River. The prosecutors have spoken, and the court of public opinion will render its decision in under eight months’ time. Yet neither one is really equipped to answer the deeper question of whether what de Blasio did was right. It’s not a simple answer: De Blasio’s defenders will argue that he only did what other officials have done, and that he had even more justification given the enmity he endured from some powerful players from day one. How, defenders will ask, was de Blasio supposed to break through the logjam in the state capital, where a Republican State Senate blocks most progressive initiatives, including de Blasio advocates, without pushing for a Democratic takeover? How could he have gone up against the powerful governor, Andrew Cuomo, in his fight for universal pre-K without support from the Campaign for One New York? But while being a progressive doesn’t mean turning the other cheek, it does require recognizing that the principles behind campaign finance laws are worth defending as much as our other beliefs, and that the mere appearance of impropriety can undermine the faith in government that is indispensable to the progressive program. Is that fair, when the Mike Bloombergs of the world can spend $102 million to get elected—sidestepping campaign contribution limits altogether—and forever be deemed “incorruptible”? No. But progressives have to accept that they will be graded—by their own allies—on a curve. The mayor’s own actions suggest a recognition that, while never breaking the law or even breaking from what is likely standard political practice, he miscalculated the trade-off between means and ends. As his 2017 campaign has ramped up, de Blasio has been seeking smaller donations. He long ago ended the Campaign for One New York nonprofit that was at the center of the allegations about quid pro quos. On those scores at least, he is closer today to the mayor progressives deserve than he was before. That’s not much of a break, but it’ll have to do.